The Samsung Galaxy S IV will be my next smartphone. As a long time iPhone user that is hard for me to say but Apple has not been innovative as of late. The new features they claim to have are ripped off hard working developers on Cydia. Samsung continues to do new things with their phone that Apple has yet to even think about. The GS4 (Galaxy S IV) will have two very cool features when it comes out. The first is called “Smart Scroll,” which will allow users to scroll through screens on the device’s display automatically as their eyes near the bottom of the screen. Not sure how much battery this will take to work right. Just think if Siri was always on all the time. The other new feature which actually sounds cool is called “Smart Pause,” which pauses any multimedia playing on the device when the user’s head turns away. 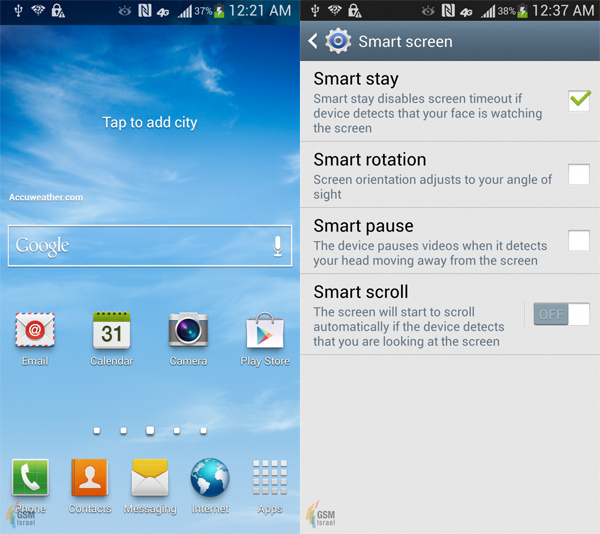 GSM Israel was the first to published screenshots from the U.S. version of Samsung’s Galaxy S IV. Samsung’s Galaxy S IV will be unveiled during a press conference next Thursday in Time Square New York City. The GS4 will have a 5-inch full HD Super AMOLED display, an eight-core 1.8GHz processor, up to 64GB of storage, 2GB of RAM, a 13-megapixel camera and Android Jelly Bean. I for one can not wait to get my hands on it.